We eat a lot of produce. Like a lot. Think 15 pounds of apples in a week if I ration. Most people agree you should eat a variety of fruits and vegetables. We try to emphasize the vegetables over the fruits, but there’s the whole fruit-tastes-way-better thing. So if we eat plants I call it a win. 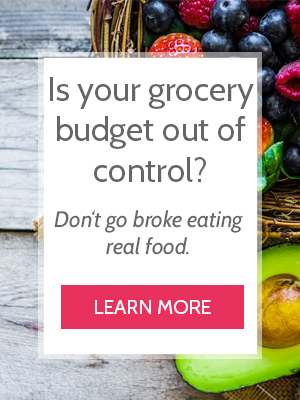 Here are 5 ways I buy fruits and vegetables without opening a wholesale grocery store account. Here’s Aldi again. Hands down the best prices on produce. They stock all the staples – lettuce, celery, apples, bananas – and carry great prices on whatever’s in season. Additionally, they sell LOTS of certified organics at prices that beat other stores. My other staple is Bulk Natural Foods. They sell seasonal produce by the box throughout the year. We buy bushels of peaches in the summer, then apples and sweet potatoes in the fall. If we don’t eat it all, I freeze it the easy way. Make friends at your local farmer’s market or with the couple selling out of their truck. I can’t tell you how much free produce I receive by shopping at one stand, building relationships, and negotiating deals. If I buy something that’s not in season, I buy frozen. Frozen produce is picked when it’s ripe, frozen quickly, then shipped. Conversely, out of season fresh produce is picked unripe, sprayed to keep it from ripening, then shipped. The taste and quality is inferior. And frozen produce retains most of its nutrients. Aldi comes to the rescue with consistent $1/bag frozen vegetables. Costco is a great source for organic frozen produce at rock bottom prices. It’s not everybody’s thing, but I slowly cultivated my gardening skills over the last 7 years. I started with a pot of tomatoes and lettuce (epic tomato fail). Then expanded to cucumbers and herbs (epic cucumber fail). Eventually, I read the Square Foot Gardening book, discovered Pallet Gardens, and BAM. Grew my best garden to date. I won’t claim gardening absolutely saves you money. It can, but be willing to slowly learn and experiment. Generally, we avoid canned vegetables outside of tomatoes and tomato paste. They’re nutritionally inferior, there’s the whole BPA thing, and the taste is ho-hum. Almost everyone agrees that lots of plants is good for your diet. Maybe I need to ration our apples a little better. However, as long as I follow these 5 guidelines, we keep a healthy variety of fruits and vegetables in our house without breaking the bank. Love this post! I need to go to Aldi more- it’s a little further away so I tend to settle for my local grocery stores instead. I know I could be saving a lot if i went there more. I agree – it’s hard to pass multiple grocery stores on the way to Aldi. But THE SAVINGS is awesome. Every time I finish checking out I’m like I LOVE THIS STORE. Every other grocery store makes me a little depressed after checkout, haha.